Not only did she comment, but she provided an excellent tool for parents and/or teachers to use in combating sexual abuse and preventing such atrocities. 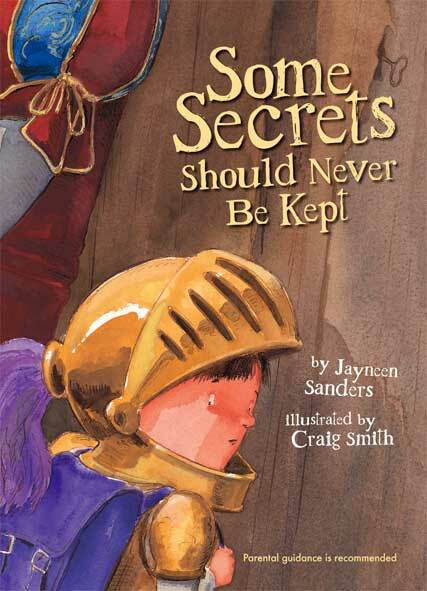 Ms. Sanders book, “Some Secrets Should Never Be Kept,” is about a little boy, Sir Alfred©, who is a victim of sexual abuse. It is not just the tale of a boy, but instead is told like a fairy-tale, which all children love to hear (I, myself, love a good fairy-tale), but can also relate to, as Sir Alfred© is a child himself. I read the book and was enthralled with it the entire time. It not only held my interest, but if read to a child or if a child reads it him/herself, I believe that he/she will feel more comfortable about opening up and telling their ‘secret.’ That’s what we want, right? We want children who have and who are enduring such trials to have a way out, a person to confide in, and a path to healing. Telling the ‘secret’ is the first step, so let’s help them take it. In addition to the actual books and teacher’s packages, you can hear the reading of the book on You Tube! The reading is done by Debra Byrne, and she does an absolutely awesome job in portraying the characters and letting you feel what poor, little, Sir Alfred must have felt. Even if you do not want to purchase the books, please listen to the reading, at http://www.youtube.com/watch?v=4YjJ1MreZqs. I guarantee that you will be satisfied and thoroughly impressed with the book and the reading. Parents, Teachers, Audience, we need to help our children. Don’t let them become victims, and if they do, don’t let them stay that way. Let’s teach them about good touch and bad touch. Let’s teach them that painful ‘secrets’ should never be kept. Let’s teach them how to survive so that they do just that. I tell my story so that others may learn from it, so that maybe another child won’t have to go through and endure the things that I have. I hope that you all take heed and help support the cause. Spread the word! Share the healing!